I'm glad to boycott Facebook, never had an account. It's hard to trust a corporation whose primary intellectual creator (Peter Thiel) is part of the steering committee of the Bilderberg meetings. Bilderberg is an annual gathering of the global elite - politicians, industrialists, financiers and others who are involved in running the world. It's not a monolith, the elite have substantial differences of opinions on how things should operate. Bilderberg includes luminaries such as Henry Kissinger, Bill Gates, the Washington Post, New York Times, Wall Street Journal, The Economist, corporate leaders from the US and Europe and other dignitaries. Many potential government leaders go to the Bilderberg meetings to be "vetted" before they are "elected." Bill Clinton attended in 1991 before he was "elected" the following year. John Edwards attended in June 2004 before he was selected as John Kerry's running mate (Kerry has been a Bilderberg member). Whether Edwards was being vetted for being Vice President or for being subservient enough to "stand down" after the Bush / Cheney campaign stole the 2004 election is a question for future historians to disclose. Barack Obama and Hillary Clinton both reportedly attended the 2008 Bilderberg meeting in Chantilly, Virginia, immediately next to the National Reconnaissance Office and a variety of other "intelligence" compounds, this meeting happened just as it became official that Obama would be the Democratic candidate for President. Obama held a large public rally just a few kilometers away from the Bilderberg meeting, his campaign refused to confirm or deny that he attended Bilderberg but it is likely the rumors that he went there are true. For decades, Bilderberg eschewed publicity. The media tycoons who attended forbade their newspapers to mention the conference. The few mentions that Bilderberg received were mostly in the pages of ultra right wing crackpot publications such as American Free Press or anti-environmental, conspiracy mongering internet radio shows such as "Infowars" with Alex Jones. Having Alex Jones and the neo-Nazi American Free Press be the main public critiques of Bilderberg serves the "fake debate" paradigm of the powers that be, since most people who distrust global corporate elites are unlikely to embrace Jones and AFP once they realize their agenda. In the past few years, some actual newspapers (London Guardian) have covered the protests outside the annual Bilderberg conclave, although not, unfortunately, the discussions inside. This increased publicity is probably the reason the Bilderberg group has finally created their own website, which includes the list of attendees and their steering committee. Minutes of their discussions are not available even though many participants are senior level politicians and the rest are various captains of industry who are at least as influential as the governmental leaders. It is probably a good thing for these people to have meetings to discuss global affairs but Bilderberg should be transparent for citizens of the world to be able to see what they are saying. Perhaps Wikileaks or something similar will be able to publish transcripts or recordings of what they say to each other. Mr. Zuckerman gets the media attention, but Mr. Thiel is probably more influential in its operation. Facebook has an online game called "Farmville" where tens of millions play a virtual farm game. I wonder how many players have ever grown a vegetable plant. "The goal is to take everything we normally do on the rest of the Internet and bring it inside of Facebook. ".... if Facebook gets its way, it'll be where you read your news, find new songs, and watch video. It will have eaten a big chunk of the rest of the Internet. There are great consequences to this. The more our online lives take place on Facebook, the more we depend on the choices of the people who run the company—what they think about privacy, how they think we should be able to organize our friends, what they tell advertisers (and governments) about what we do and what we buy." Thank you for what you do. Everything about it. I am curious about policies regarding use of social networking data in the news media. Your website and mission seem influenced by Foucault; while the acquisition of data by secret, disembodied police units certainly represents the watch tower at the heart of the panopticon, the way individuals become complicit in these systems of repression is also important. Surely individuals are aware that the newsmedia can access (and subsequently hyperbolise, spin and broadcast) information about them. 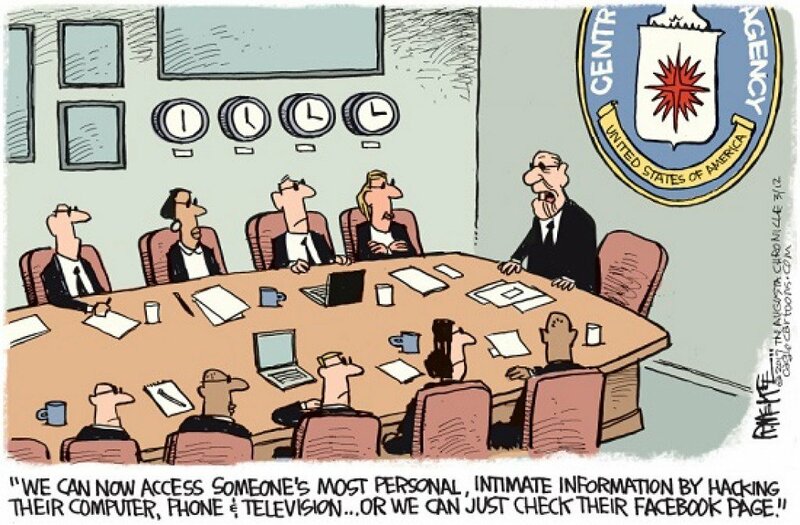 I wager that while social networking sites have given token security measures to individuals, newsmedia organisations might still have back-door access (like the spies). Agreements between newsmedia and social networking sites, or even the undoubtedly porous policies regarding newsmedia exploitation of data acquired from social networking sites could be an interesting addition to your impressive archive. You're the first to comment correctly on the Foucault influence. My colleague, Deborah Natsios, is researching, writing and lecturing in that intellectual terrain more formally while undergirding the Cryptome popularization. Some of her work is listed on natsios-young.com, links to which are provided on Cryptome as they become public. Spying on Internet users is a gold mine for all predators of authoritative mediation. They cannot believe their good luck to get access to such voluminous person-specific data. Nothing like it before, and so craftily camouflaged with ubitquitously deceptive privacy policies. There could be a collapse of this spying boom, or let us hope, when the varmints turn on one another such as China and Google are doing, and others gargantua are intending to battle over dominance via the Internet of Internets in the works along with competing operating systems, data farms and as you note social media privacy killing fields. The parallel with secret financial arcana collapsing world markets is striking. I look forward to revelations of just how much profit there is in spying in all its manifiestations. The old-fashioned government kind seems quaintly cheap but perfect for diversion and most of all a justification for secrecy. .... Theoretically, our representative republican democracy is governed of the people, by the people, and for the people. But how can the people govern – how can we have a representative republican democracy – when the people are never informed about what is really going on? Secrecy isn’t maintained like it is to protect national security, it is maintained so that an ignorant electorate can be manipulated into doing what the ruling oligarches want done. I am on the point of despair for my country. Jules Witcover wrote a book about 1968 titled “The Year the Dream Died.” There are some of my generation that have refused to accept the premise of the title of that book. We’ve continued to believe and to work for the dream that America once represented. And there are many out there who still do. But the country sleeps on. My leaving Facebook doesn’t mean that I’ve given up. Those who know me know that my motto is “Never ever ever give up.” But FB, I fear, has been taken over by the trolls. Your newsfeed is carefully controlled. Your activity is monitored. “Controversial” posts that don’t reflect the opinions of the gatekeepers tend to disappear quickly, even from your own history pages if you’ve posted them. So, I think there are more productive ways for me to use the few years remaining to me – other ways to try to lift the flags of faith, freedom and love. So I will try to pursue those. More and more seemingly unlikely supporters of US presidential candidate Donald Trump are emerging from the woodwork, and the most recent one hails from a region not known for populist extremism—Silicon Valley. Peter Thiel, an entrepreneur and investor best known as the co-founder of Paypal, has pledged to be a Republican delegate for Trump in the upcoming California primary. The Sacramento Bee lists Thiel as one of 172 delegates. Facebook has 59 million users - and 2 million new ones join each week. But you won’t catch Tom Hodgkinson volunteering his personal information - not now that he knows the politics of the people behind the social networking site. Facebook is a well-funded project, and the people behind the funding, a group of Silicon Valley venture capitalists, have a clearly thought out ideology that they are hoping to spread around the world. Facebook is one manifestation of this ideology. Like PayPal before it, it is a social experiment, an expression of a particular kind of neoconservative libertarianism. On Facebook, you can be free to be who you want to be, as long as you don't mind being bombarded by adverts for the world's biggest brands. As with PayPal, national boundaries are a thing of the past. Although the project was initially conceived by media cover star Mark Zuckerberg, the real face behind Facebook is the 40-year-old Silicon Valley venture capitalist and futurist philosopher Peter Thiel. There are only three board members on Facebook, and they are Thiel, Zuckerberg and a third investor called Jim Breyer from a venture capital firm called Accel Partners (more on him later). Thiel invested $500,000 in Facebook when Harvard students Zuckerberg, Chris Hughes and Dustin Moskowitz went to meet him in San Francisco in June 2004, soon after they had launched the site. Thiel now reportedly owns 7% of Facebook, which, at Facebook's current valuation of $15bn, would be worth more than $1bn. There is much debate on who exactly were the original co-founders of Facebook, but whoever they were, Zuckerberg is the only one left on the board, although Hughes and Moskowitz still work for the company. Thiel is widely regarded in Silicon Valley and in the US venture capital scene as a libertarian genius. He is the co-founder and CEO of the virtual banking system PayPal, which he sold to Ebay for $1.5bn, taking $55m for himself. He also runs a £3bn hedge fund called Clarium Capital Management and a venture capital fund called Founders Fund. Bloomberg Markets magazine recently called him "one of the most successful hedge fund managers in the country". He has made money by betting on rising oil prices and by correctly predicting that the dollar would weaken. He and his absurdly wealthy Silicon Valley mates have recently been labelled "The PayPal Mafia" by Fortune magazine, whose reporter also observed that Thiel has a uniformed butler and a $500,000 McLaren supercar. Thiel is also a chess master and intensely competitive. He has been known to sweep the chessmen off the table in a fury when losing. And he does not apologise for this hyper-competitveness, saying: "Show me a good loser and I'll show you a loser." But Thiel is more than just a clever and avaricious capitalist. He is a futurist philosopher and neocon activist. A philosophy graduate from Stanford, in 1998 he co-wrote a book called The Diversity Myth, which is a detailed attack on liberalism and the multiculturalist ideology that dominated Stanford. He claimed that the "multiculture" led to a lessening of individual freedoms. While a student at Stanford, Thiel founded a rightwing journal, still up and running, called The Stanford Review - motto: Fiat Lux ("Let there be light"). Thiel is a member of TheVanguard.Org, an internet-based neoconservative pressure group that was set up to attack MoveOn.org, a liberal pressure group that works on the web. Thiel calls himself "way libertarian". Clearly, Facebook is another uber-capitalist experiment: can you make money out of friendship? Can you create communities free of national boundaries - and then sell Coca-Cola to them? Facebook is profoundly uncreative. It makes nothing at all. It simply mediates in relationships that were happening anyway. Thiel's philosophical mentor is one René Girard of Stanford University, proponent of a theory of human behaviour called mimetic desire. Girard reckons that people are essentially sheep-like and will copy one another without much reflection. The theory would also seem to be proved correct in the case of Thiel's virtual worlds: the desired object is irrelevant; all you need to know is that human beings will tend to move in flocks. Hence financial bubbles. Hence the enormous popularity of Facebook. Girard is a regular at Thiel's intellectual soirees. What you don't hear about in Thiel's philosophy, by the way, are old-fashioned real-world concepts such as art, beauty, love, pleasure and truth. The internet is immensely appealing to neocons such as Thiel because it promises a certain sort of freedom in human relations and in business, freedom from pesky national laws, national boundaries and suchlike. The internet opens up a world of free trade and laissez-faire expansion. Thiel also seems to approve of offshore tax havens, and claims that 40% of the world's wealth resides in places such as Vanuatu, the Cayman Islands, Monaco and Barbados. I think it's fair to say that Thiel, like Rupert Murdoch, is against tax. He also likes the globalisation of digital culture because it makes the banking overlords hard to attack: "You can't have a workers' revolution to take over a bank if the bank is in Vanuatu," he says. If life in the past was nasty, brutish and short, then in the future Thiel wants to make it much longer, and to this end he has also invested in a firm that is exploring life-extension technologies. He has pledged £3.5m to a Cambridge-based gerontologist called Aubrey de Grey, who is searching for the key to immortality. Thiel is also on the board of advisers of something called the Singularity Institute for Artificial Intelligence. From its fantastical website, the following: "The Singularity is the technological creation of smarter-than-human intelligence. There are several technologies ... heading in this direction ... Artificial Intelligence ... direct brain-computer interfaces ... genetic engineering ... different technologies which, if they reached a threshold level of sophistication, would enable the creation of smarter-than-human intelligence." So by his own admission, Thiel is trying to destroy the real world, which he also calls "nature", and install a virtual world in its place, and it is in this context that we must view the rise of Facebook. Facebook is a deliberate experiment in global manipulation, and Thiel is a bright young thing in the neoconservative pantheon, with a penchant for far-out techno-utopian fantasies. Not someone I want to help get any richer. The third board member of Facebook is Jim Breyer. He is a partner in the venture capital firm Accel Partners, who put $12.7m into Facebook in April 2005. On the board of such US giants as Wal-Mart and Marvel Entertainment, he is also a former chairman of the National Venture Capital Association (NVCA). Now these are the people who are really making things happen in America, because they invest in the new young talent, the Zuckerbergs and the like. Facebook's most recent round of funding was led by a company called Greylock Venture Capital, who put in the sum of $27.5m. One of Greylock's senior partners is called Howard Cox, another former chairman of the NVCA, who is also on the board of In-Q-Tel. What's In-Q-Tel? Well, believe it or not (and check out their website), this is the venture-capital wing of the CIA.